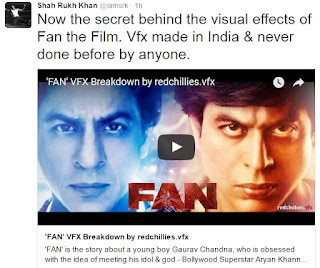 Shah Rukh Khan took to Twitter to share a video which reveals the secrets behinds the VFX of the movie Fan. The video offers a detailed breakdown of the VFX techniques employed by Redchillies.VFX. Here is what SRK's tweet originally read: "Now the secret behind the visual effects of Fan the Film. Vfx made in India & never done before by anyone." At a time when the entire country is talking about Make in India, it is heartening to see the Indian film industry finally becoming self-reliant as far as cutting edge VFX is concerned. Fan was tagged as a nigh impossible project right from the word go but the creative team of Redchillies.VFX took it up as a challenge and achieved the unimaginable. They succeeded in making an actor look much younger than his actual age for the entire duration of the 140 odd minutes, something that has never been achieved in the world at this scale using VFX. As many as 1850 VFX shots were delivered by the team on the Face and Body Shrink portions of Shah Rukh Khan for the character of Gaurav and another 1450 for the extensive set extension and background creation work throughout the movie. Fan’s cutting edge VFX is a first for Hindi cinema and perhaps a parallel can be drawn to what the Lord of the Rings proved to be for Hollywood. Fan’s rather grim ending may have marred its prospects at the box-office but about ten years from now it would be remembered not for its ending but for its courage and cinematic vision. Fan earlier made it out our annual Top 10 and Top 5 lists for the best Bollywood films of 2016. True! SRK is not call king Khan without a reason. The VFX seems enthralling, I would love to learn some of these!